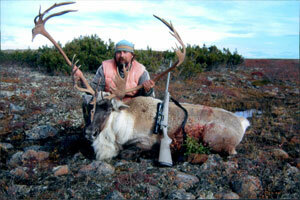 Caribou Hunting High North Outfitting fly-in hunting and fishing camp in Quebec. The actual hunt will usually change day to day depending on what the animals are doing. It could be purely spot and stalk, wait in ambush or a combination of the two. Each morning you will leave camp by boat with your guide. Each guide usually has their "favourite" areas to hunt but a lot of thought comes into the final decision every morning based on what went on the day before. Your guide will be with you to help judge the quality of the bulls that you are seeing as caribou all tend to look massive. This is primarily the Leaf River Herd which is the largest and healthiest herd in northern Quebec, however we will get a mix of the George River Herd throughout the season. 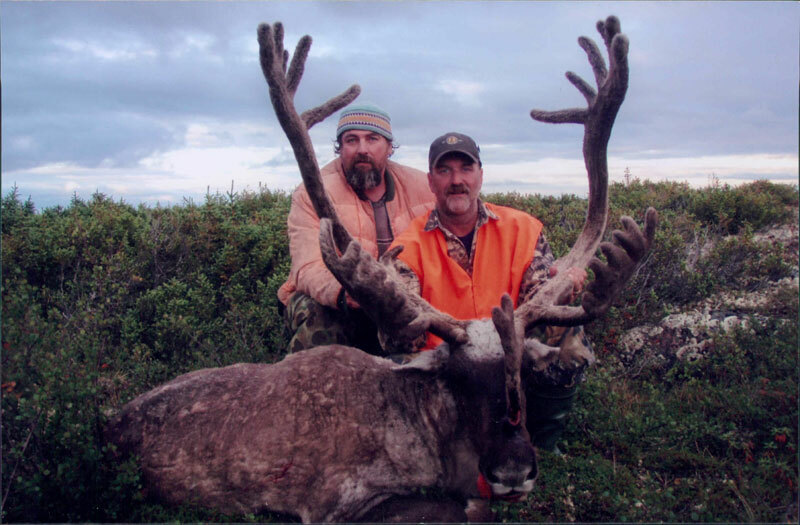 The camp operates it's caribou hunts during prime time beginning mid August and running through until the end of September and can be enjoyed with rifle, bow or black powder. Northern Quebec's migratory caribou herds criss-cross an area of over 1,000,000 square kilometers (400,000 square miles) and can travel up to 6,000 square kilometers (3,700 square miles) per year. According to the Government of Quebec 2001 census, the Leaf River herd has more than doubled since 2001 up from 260,000 to 628,000 caribou and the George River herd includes about 385,000 caribou. The Leaf River herd is a very healthy herd and over the past ten years has been the most reliable in both migration time and pattern as well as trophy quality. In hunting a migratory herd we will spend most of the days on the hill tops "glassing" the open tundra in search of groups of large bachelor bulls as well as solitary bulls in search of a harem of his own. Please note that during the hunt everyone must wear at least 400 square inches of hunter orange that is visible from all directions. Minimum rifle caliber is .243. Handguns are not permitted and are illegal. It is highly recommended that you make use of a scoped rifle, have better than average optics, top of the line hunting boots, and good quality rain gear.